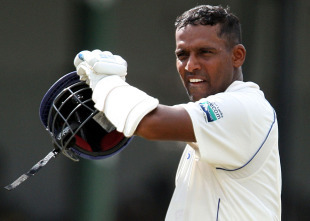 Get the erasers out and start removing the asterisk against Thilan Samaraweera's record. Two days ago, his century in difficult conditions was being belittled by critics, who find him boring, a flat-track bully, or a fair-weather batsman, or all of them. He laughed at the suggestion that most of his centuries have come after the top order has scored heavily, and then disagreed. "I have got some hundreds at crucial moments," Samaraweera had said after his first-innings century. "When the top order has not scored runs, against Pakistan we were 9 for 3 (in Faisalabad), I got a hundred, and against Bangladesh we were 20 for 4. I don't think I have got (all the) runs when the top order has scored runs. I have scored runs when they were important for the team. But this is a special one because this is a real Test wicket. Your skills are tested here unlike in SSC. I am happy to get a hundred here." His first-innings century didn't come in a dire situation. Sri Lanka were 241 for 4 when Samaraweera came in to bat, and then he had a good partnership with Angelo Mathews too. Although not a crisis, it was a time when all could have gone wrong. Samaraweera didn't let that happen. In the second innings, though, all had gone wrong. Sri Lanka were 87 for 7, leading by 76, the rest of the line-up had combusted, and the word going around was "now we will see what he (Samaraweera) is made of". When he walked off for a smartly made 83, featuring partnerships of 38 and 118 with Lasith Malinga and Ajantha Mendis respectively, he was greeted by an appreciative crowd. For company during a major part of his effort, Samaraweera had a familiar ally. In Mendis' last three Test innings, he has had partnerships of 73 (19.3 overs), 35 (13.4 overs), and 118 (38.4 overs) for the ninth wicket with Samaraweera. All against India. Both of them must be doing something right, India must be doing something wrong too. Samaraweera, for starters, has been batting until the end despite the fall of wickets. He is also an under-rated tactician. He reads situations fast. He plays spin superbly, with quick feet and soft hands. He compensates for lack of power with cricketing acumen and graceful strokes. Samaraweera trusts Mendis, who has worked hard on his batting. He also knows which bowlers might trouble Mendis. He is not uniform with farming the strike. In the first innings, for example, he took singles in the first half of the over, except when facing the dangerous-looking Pragyan Ojha. In the second innings, even long after Mendis had started looking like a proper batsman, Samaraweera kept making impromptu decisions of turning down singles. He had the pitch and the bowling sussed out. In between, Samaraweera struck opportunistic boundaries too, using his feet to upset the spinners' rhythm. He first drove Amit Mishra through the covers, and then charged at Ojha and lofted him over mid-off. At that point the field was spread for him, something he perhaps relished. The late-cut was used for singles and the occasional four. He didn't shy away from the powerful sweep, a shot he doesn't normally employ. In the over that Samaraweera reached his fifty, he was at his best. First he swept Virender Sehwag and bisected the gap between deep square and deep midwicket. Then came the paddle sweep, fine enough to take two. Then a punch nicely placed between long-off and sweeper-cover for two. And then, off the last ball of the over, a better placed inside-out drive to let him take three and retain strike. Mendis responded to Samaraweera beautifully. He stayed alert for the calls for singles, he didn't run away from bouncers, and also played a few smacking shots. For long has he been a thorn in India's side. Today he did that with the bat. At times MS Dhoni placed three fielders at third man for Mendis, and asked his quicks to bowl bouncers from round the stumps. Mendis still survived. It was his batting that got the crowd involved. His family and his partner were there too. Percy Abeysekara, the famous Sri Lankan cheerleader, wanted to kiss him on the cheek. For the purists who miss proper tailenders who provide funny moments by backing away, playing with eyes closed, Mendis saved the best for until Samaraweera got out. The inside edge, the top edge, the lovely correct straight loft and the awkward defensive shot were all there. All through, he couldn't stop grinning. India will remember that grin from two years ago.